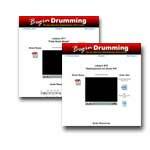 Begin Drumming System - Video drum lessons - Learn drums online using advanced multimedia drum lessons! 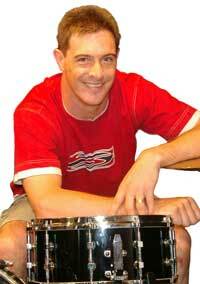 Revolutionary Multimedia Drum Training System! 4 hours of Video Lessons. Begin Drumming is a 100% comprehensive drumming course which takes you from absolute beginner, to expert soloist, without the short cuts! Learn drums faster and easily with the unique combined approach of video, audio, text and graphics. No dodgy short cuts for fast but false results. You learn fast because of great lessons, but you won't miss out on learning to read music, or learning correct technique. No gimmicks to waste your time - you go straight to learning the essential skills required to be a professional, working drummer. I know what it is like to learn the drums and I have seen the frustrations of students when they don't understand concepts. I've seen students who struggle later on with their playing because they didn't get the right start in the early stages. If you really care about learning the right way, then read a bit further about how Begin Drumming will help you reach your true drumming potential. WAIT! You can get FIVE of these lessons FREE - right now! Yes that's correct! I'm giving you a preview of what you can expect from the Begin Drumming System. You will get 100% free access to FIVE of these unique video drum lessons. Here's the deal... I wan't you to do me a favor... Scroll down this page and read a bit about the Begin Drumming System. Many readers see the incredible value of this deal right away and pay the riduculously small price immediately, but if you are still not convinced, you can take a closer look at the lessons. Get your 5 FREE Lessons Here! Just put your first name and email in the box above or at the bottom of the page, and you will immdeiately get an email from me with a link to your Free lessons. In fact - considering my 100% satisfaction guarantee - you could actually try the whole product for a whole 56 days with no risk to you at all! >Click Here for Full Access Now! 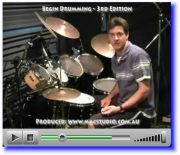 So Let's look at what is included with "Begin Drumming"
In Forty Five multi-media lessons you'll learn all aspects of drumming from holding the sticks and the basic stroke types, through to playing all the important drum rudiments, and all the drum beats for todays Rock styles. 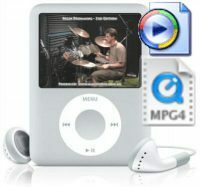 Over four hours of video instruction, downloadable as MP4 or Windows Media files. This means that you can either watch them on your computer, or transfer them to your portable media player, so that you can watch them on the go, or even right at your drum kit! 52 pages of printable materials!Each lesson comes with text and graphics which can be viewed on the screen, or printed out for use in the practise room. We'll even supply all the material in one file so you can print it out and bind it as a book if you prefer. "Begin Drumming" started life as a book, and that is why you'll find it really clearly and simply laid out. 198 audio files of all the beats and solos, played at various speeds to help you learn. These are laid out in a convenient and simple format so that you can download just the ones that you need to help you learn the patterns. Play them from the computer, or stick them on an mp3 player or CD to help you at the drum kit! My name is Jim McCarthy. Let me tell you why I am the perfect person to create this drum tuition course especially for YOU. ONE: I have an enormous amount of knowledge as a teacher. I have been teaching drums for almost 20 years, and it has been my very-nearly full-time obsession for the last ten of those twenty years. The "Begin-Drumming" system in fact was originally created for my own beginning students - because I simply couldn't find any other books or systems available which covered everything required in a systematic and logical way. This system wasn't created quickly - the materials have been constantly tested, reorganized, refined and improved over these last ten years. I have dedicated myself to learning about the best teaching methods, and how YOU learn! In fact, I just did some quick sums on the calculator and worked out that I would have given over TWENTY THOUSAND lessons! TWO: I don't want to boast, but I have done lots and lots of study - in fact I have a Masters Degree in Percussion performance. This means that I studied the art of drumming and drum technique for Six Years Full Time. This means that I did as much study as most medical practictioners. If you wanted to learn about medicine, you wouldn't care about choosing a doctor who looked young and hip! You'd want one who knew what they were doing, and who had done the study in the appropriate area - and why should Drumming be any different? The fact is that I know a lot about drum teaching - I've done it for twenty years, and I know that anyone is able to learn to play the drums. More importantly I know what approaches and explanations work in lessons and which ones don't. These lessons have worked for literally hundreds of my own students, and now they can work for you as well. What Makes Begin Drumming Unique? There are a lot of drumming courses, books and videos available, all which cover basically the same materials. There are some important differences which make my course different from all the others. 1. I go through the Basic Techniques on the practice pad. In lots of the early lessons I use a pair of sticks and a practice pad - a small "imitation drum", which allows me to focus on the main issues, the techniques of holding and moving the sticks. 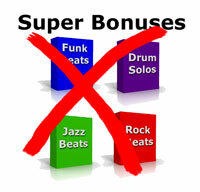 This means that you can use this course straight away, even if you don't yet have a drum kit! It's not just about hitting the drum - there are so many different types of stroke which affect the note production, and this is what separates a good drummer from an average one. It's the Rudiments of drumming like the Paradiddles, the Flams and the Accents that make you able to not only play fast, but be able to sound great on the drums. In Begin Drumming you'll see the Rudiments notated really clearly on paper, and you'll be able to see me demonstrate them on the video. You'll see me apply everything to the drum kit, not only through playing beats, but also the solos and rudiments as well. In Begin Drumming you start with the techniques, then apply the techniques. You won't make the mistake of going straight to the drums then trying to sort out the techniques later. In Begin Drumming the lesson format allows you to learn at your own pace, and refer to the individual lessons and videos as you need them. When you go to traditional lessons you have to follow the teachers plan, and learn what the teacher might want to teach you, but with this format of lesson YOU are in control. You can learn as much or as little as you like at once, and you can go to your drum kit and practice the skills you have just learned. When you feel you need a bit more, simply watch the next lesson! This is so much better than traditional lessons - there is NO RULES about how fast or slow you get through the lessons, it is completely up to you! A unique way of learning Drum Beats that puts YOU in the drivers seat of your learning! An essential part of drumming is learning the basic beats or patterns. In Begin Drumming I have put together a unique way for you to learn exactly what you need, without making it painful for you to sit through things that you can already do. Just think about it - this is like having your teacher directly on tap when you need them! If you aren't sure how a particular beat sounds when you are practicing, simply dial it up on your computer or media player and play along with it! This is an incredibly powerful resource - you will be able to use this resource every time you practice, so that your "library" of beats and fills will be hugely improved. Each of these beats are Audio Recorded for 45 seconds at each speed, as well as all the solos and other exercises. This in total gives you 198 separate audio files, which you download as you need. No Gimmicks, No Fancy Bonus Deals - Just the quality tuition you need! Of course I could have split this up into ten different products, or I could claim that each individual beat was a different "lesson", and I'm going to give you hundreds of them as extra bonuses, but I'm not going to do that. I'll leave all the sets of steak knives out of this deal - because I know you don't need them. I'm about giving you everything you need to sound great on drums, and nothing extra to just waste your time! To learn the amount of material that is included in Begin Drumming from a private teacher would cost you hundreds, if not thousands of dollars. With Begin Drumming you get exactly what you need, and it only costs $49.95 for a twelve month membership. Twelve months is all you need, and remember that you can download everything, so even if you don't complete all the lessons within the twelve months you will be able to download them all and complete them in your own time. If You Don't benefit - You Don't Pay! I've spent years putting together and refining this program, and I know that it works, but I understand that you might still be hesitant to see if this program can deliver what you need to learn the drums. If you choose today to join with a full membership of Begin Drumming you can try out all the lessons and see how much you can benefit from the full program. so there is absolutely NO RISK to you. Why not take a sneak preview at FIVE of these unique lessons 100% free.. Finally, I'm going to leave you with one piece of advice: Please make sure that you do get some help with your drum technique in the early stages. I have seen many drummers with arm and tendon injuries, that could have been avoided, if only they had learned the correct techniques in the early stages. This is genuine, and I know of drummers who have had to give up playing because they have tendonitis and it hurts too much to play. If they had just had a few lessons and learned to play the right way, then they could have avoided all these problems. Begin Drumming is one way that you can get quality instruction, without having to go to lessons with a private teacher, and if you follow my guidance you too can have a very long and successful drumming future. You owe it to yourself to learn drums Now with Begin Drumming, so what are you waiting for? PS. This is a one-off purchase which means we won't ever charge you again for access to the same product! But don't forget that there are strictly limited numbers of memberships available at this ridiculous 96% discount price. PPS. With Begin Drumming you can learn up to 258% faster than other online lessons, and you won't take any short cuts by missing vital steps. PPPS. Just $49.95 is 200% to 400% cheaper than other online lessons. It's 3075% - yes - that's three thousand and seventy five percent - cheaper than having theses same lessons delivered by a teacher, and you get even better results! Learn faster and save a bundle by getting access NOW!